Primary pilot training is the bread and butter of most flight schools. We all spend a lot of time and energy getting private pilot students in the door, and then we spend a lot of time and energy training them and then, after just a few months or a year, they pass a check ride and all but disappear. If you’re really lucky they’ll come back and fly a loop or two around the pattern every few months, but then, often, they fall off the radar - literally. Some students will come back for an instrument rating, and a rare high achiever will return for a commercial certificate. But what about the others? How can we keep students engaged beyond the private pilot certificate? And how can we appeal to a wider population? Perhaps it’s time to think outside the box - and inside the simulator - and consider these alternatives to the traditional flight training courses. (Hint: If you think that you can’t offer mountain flying courses because you aren’t located near any mountains, think again!) These courses might just bring those old students back and attract new students, too. Just because your flight school is located in the Great Plains does not mean that you can’t offer a mountain flying course. A ground course coupled with simulator sessions will do the trick. It’s much less expensive than the all-airplane course in the actual mountains, anyway. And safer, too. There’s nothing like hands-on actual mountain flying, but an intro course in the simulator is a great start! It’s difficult sometimes for a student pilot to really gain proficiency in crosswind landings during a traditional private pilot course. Sometimes, the winds just aren’t there when you need them to be. Other times, a student will demonstrate proficiency good enough for the check ride but not quite good enough to make them comfortable flying in crosswinds. A crosswind course in the simulator is great for those students struggling to find a windy day, or for those who want to become more proficient at landings. It’s a no-brainer. The “pinch-hitter” course has been around flying clubs and flight schools for a long time. It’s a short course to introduce friends and family members of pilots to the aviation world in an effort to make them more familiar and comfortable with the airplane that they occasionally fly in. Pinch hitter courses often teach basic radio communications, basic aircraft control and emergency procedures. Once again, a simulator is perfect for this type of course. The students involved will feel more comfortable learning things on the ground, and demonstrations can be done with more than one person in the simulator, making it a fun course for friends and family members who want to learn together. Pilots are always interested in how to handle emergencies, and there are just way too many emergencies that we can’t train for in the actual airplane for safety’s sake. Think single-engine training for multi-engine pilots, cockpit fires, surprise events like icing situations or a gradual loss of engine power. All of these are difficult or impossible to train for in the actual airplane, and a simulator can be a very valuable tool for flight schools in this regard. Offering a confidence course in emergency procedures can be a huge success for flight schools looking to increase revenue while also sparking the interest of the pilot population and increasing pilot proficiency. One of the best uses for simulators is to demonstrate unsafe maneuvers and pilot errors without the hazard of actually demonstrating the same maneuvers in flight. And one of the really fun things to do with simulators is use them for FAA Safety Night sessions. These are quick mini-sessions in the simulator, usually with a group of people interesting in learning a specific topic. Ever thought about flying while intoxicated? Have a couple of volunteers fly the simulator after a single drink, then two drinks, then three, and watch their IFR approach skills degrade right before your eyes. Curious how icing affects your stall speed? Use the simulator to add icing, little by little, to your airframe and see how the airplane reacts. Wondering how good you are at flying an approach to the absolute minimums in the mountains at an unfamiliar airport? Make it a safety night topic, and people will not only learn a thing or two, but they’ll also be entertained. The possibilities of nontraditional training courses for pilots are endless when you have a simulator. 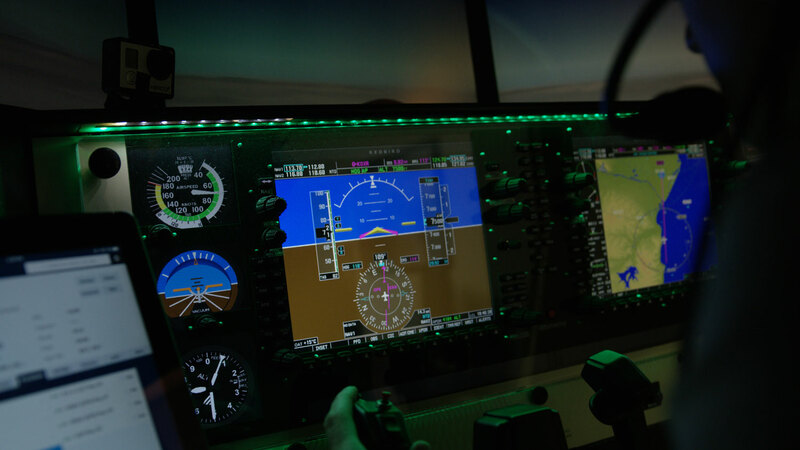 Complex and high-performance training, glass cockpit transitions, turbine aircraft transitions, crew resource management training or single-pilot IFR training, and international operations can all be accomplished with a simulator. The bottom line: Offering specialized courses like these will increase student involvement, keep pilots interested in coming back to your flight school and increase your revenue. And you’ll be doing your part toward creating safer, more proficient pilots. Everyone wins!